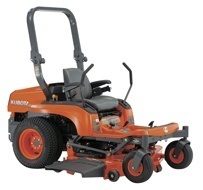 Lawn care is more of a pleasure than a chore with Kubota’s ZG200 Series compact zero-turn mowers – featuring a comfortable, cushioned seat, user-friendly controls and exceptional cutting performance. PEDAL-TYPE LIFT SYSTEM: Easily roll right over obstacles – simply push a pedal and the hydraulic lift system raises the mower deck. Or, when needed, a special one-touch lock allows you to keep the deck raised for transportation. OPERATOR COMFORT: 1. Spacious operator deck has an uncluttered floorboard to give you ample legroom. 2. Enjoy an adjustable, cushioned seat with sturdy, padded armrests and an attached seatbelt for your protection. 3. Cup holder. 4. User friendly instrument panel keeps essential controls and indicators, like the fuel gauge, close for easy viewing. 5. Foldable ROPS to ensure operator safety. EASY MAINTENANCE: 1. For routine maintenance like adding oil, simply lift the hood. 2. Seat panel lifts up for easy access to the HST. 3. Easy access to upper mower, mower belts and universal joint with a hatch built into the operator’s platform.